"If everyone is fed, does it matter how big the gap is between the wealthy and the poor?" Since I am wading through the dense paragraphs in the Compendium of the Social Doctrine of the Church (that link will get you all the sources for the quotes below), I have been knee deep in this subject matter for nearly a month now. I also spent several years working with the welfare population in a not-so well off town. I am not agreeing or disagreeing with the above statement, but I ask that you keep it in mind as I ramble through this post. 165 A society that wishes and intends to remain at the service of the human being at every level is a society that has the common good — the good of all people and of the whole person — as its primary goal. The human person cannot find fulfillment in himself, that is, apart from the fact that he exists “with” others and “for” others. I have long upheld that it is not my duty to vote for the government to care for those in need, but for me to do this myself. I believe that the best way to serve those in need, is at the smallest level possible: first in family life, and then our communities. The bigger the pool of people becomes, the more difficult it becomes to provide tailored services that provide the most help, without enabling or prolonging the suffering. 166 The demands of the common good...concern above all the commitment to peace, the organization of the State's powers, a sound juridical system, the protection of the environment, and the provision of essential services to all, some of which are at the same time human rights: food, housing, work, education and access to culture, transportation, basic health care, the freedom of communication and expression, and the protection of religious freedom. The freedoms listed above also allow for people to be cruel. To have opinions or beliefs that are untrue or bias. That does not make them right: as a Christian, I am called to serve all. To love all. A government cannot allow laws to be put into place that go against our basic human rights. It is difficult to remember sometimes that the standard of living the majority of Americans experience, is not the equivalent of human rights. State of the art technological advancements are not basic rights. No amount of wealth redistribution will end poverty. No amount of government intervention will end it either. Our duty on earth is to serve others: to imitate Christ. 187 The principle of subsidiarity is opposed to certain forms of centralization, bureaucratization, and welfare assistance and to the unjustified and excessive presence of the State in public mechanisms. “By intervening directly and depriving society of its responsibility, the Social Assistance State leads to a loss of human energies and an inordinate increase of public agencies, which are dominated more by bureaucratic ways of thinking than by concern for serving their clients, and which are accompanied by an enormous increase in spending”. There is dignity in work. Work dignifies people. It is healthy. To borrow a term, the Social Assistance State puts this dignity into danger. 188 Various circumstances may make it advisable that the State step in to supply certain functions. One may think, for example, of situations in which it is necessary for the State itself to stimulate the economy because it is impossible for civil society to support initiatives on its own. One may also envision the reality of serious social imbalance or injustice where only the intervention of the public authority can create conditions of greater equality, justice and peace. In light of the principle of subsidiarity, however, this institutional substitution must not continue any longer than is absolutely necessary, since justification for such intervention is found only in the exceptional nature of the situation. In sum, humans find worth in helping others and in community. There are basic rights afforded to all, but we cannot expect the government to serve those that are our responsibility. Some circumstances would warrant temporary interventions, but long term solutions that would have elected officials and taxes do our duties for us do damage to us all. I think the question is misleading. I think it is not really the right question at all. Are we caring for the most destitute in our communities? 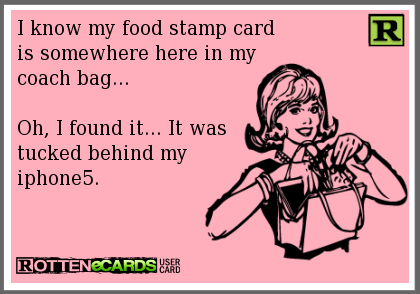 We use social service programs like food stamps as a crutch to lean on; an excuse. We use it to imply that those that need food and shelter have it supplied for them, but you know. Only the ones that can't help it. Only the ones that we find deserving enough. We judge and trivialize and minimize plenty. Our duty as Christians is not merely to serve those we feel need our help, but also to serve those that we don't think deserve it. Perhaps the truer and more difficult calling for us today, is to serve not just those in need, but those who are in need because of their own doing. It is easier to swallow helping someone down on their luck than it is to help someone who fell victim to their own devices. Christ didn't choose to die for Himself. He chose to die for our sins. He chose to serve us even though we chose against Him. This is exactly what Christ would say. There are many forms of poverty. Maybe financial poverty can ideally be resolved with a large budget and wealth redistribution, but poverty will still exist.